How to Write an Effective Personal Statement? If one is applying abroad for a graduate or a PHD programme, then they will have to write a statement of purpose. Honestly, it might seem the most difficult but important thing for one to write. Just one or two pages in length, your statement of purpose can make or break your application. Almost all graduate programs will require you to include a personal statement in your application package. However, it is common for graduate programs not to provide a prompt or guidelines. This leaves many applicants wondering what exactly the admissions officers will want to see in the essay. 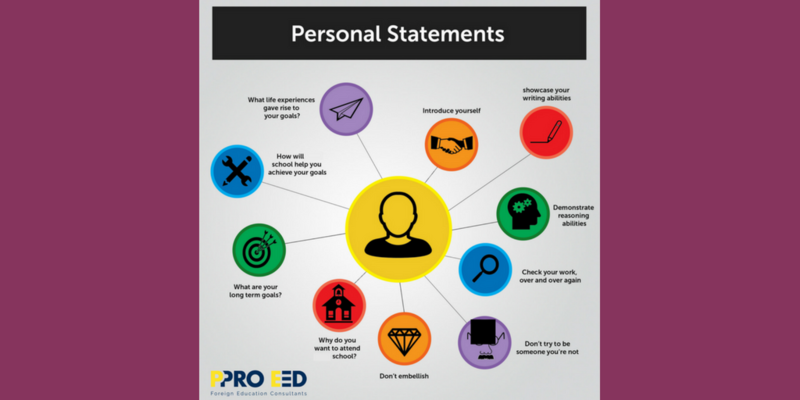 Whether you’re just starting to brainstorm for your essay or whether you’re in the middle of the writing process and wondering if you’re on track, use this guideline to help you create an effective personal statement that will help you get noticed. With a well-crafted statement of purpose, one can persuade an admissions committee to accept them. In order to convince the committee, it’s very important to be convinced yourself. To be sure of what you want, why you want it, and why that particular program can help you. It’s very important for you to be able to answer yourself as to why should the school select you over someone else? Know your strengths and weaknesses. Think before writing; review your intellectual and personal development over your academic career. Before indulging in an essay like this one must have a thesis statement. The first sentence is the most important one because it gets the reader’s attention. This is the one sentence that introduces the central idea of the paper. This statement should sum up the basic meaning of the essay, and signal to the reader what to expect! A strong opening paragraph of five sentences or less is needed, briefly explaining who you are, where you’re from or why the particular field to which you’re applying, and why this particular university is the first of your choices. Discuss which course you’re interested in pursuing and most importantly give an explanation as to why it interests you. Be specific in what gears you towards pursuing that discipline and why you’ve chosen that particular course. The first paragraph is very important. It’s the introduction and should hook the reader from the start, after all, you do want the reader to continue reading! The body of the paper – Each paragraph should deal with a single central idea. This should be introduced early in a topic sentence, telling the reader what exactly to expect in the paragraph. Several ideas in a single paragraph will only confuse the reader. If the central ideas have several supporting points, break it into several paragraphs rather than having one very long paragraph. Support your ideas, don’t just spit them out without backing – By giving support to your ideas you convince the readers of their truth and accuracy. If you successfully prove your statements, the reader should agree with your conclusions. Structure the sequence of ideas carefully and logically – Remember you are mapping a course, leading the reader through the points that support your thesis. You don’t want to confuse them or make them take a long way around. Transition smoothly from paragraph to paragraph to link them together logically. Use connecting sentences to keep the paper flowing smoothly. In this part, speak about your academic background. Mention important details like what you studied and when. Explain how your previous course equipped you with the right skills, and how having those skills handy will help you advance in your future course or degree. This is your chance to prove how your previous academic background will pave the way for an easy transition into your higher education. Emphasize the jobs you’ve taken up so far and the responsibilities you’ve held as part of your role. Anything and everything from an internship to opening up your own business venture can be added. Don’t forget to mention how taking on these roles along the career ladder gives you an edge. It also makes complete sense to join the dots on how staying equipped with skills learnt from your work experience will help you manage the workload of your intended course. Going forward, also briefly explain how your work exposure has developed your interest to pursue the degree you intend to. One of the most common ways in which graduate school applicants weaken their statements is by including generalizations or not clearly explaining how something connects to the decision to pursue graduate studies. Therefore, include anecdotes in your personal statement that reflect the development of your skill set. You may also want to create a balance between skills specific to the profession as well as ‘soft skills’ such as leadership or teamwork. Let the admissions officers see you applying your skills successfully in a variety of real-world scenarios. Each anecdote should help the admissions officers better understand your background as it relates to your ability to excel in your chosen program. Avoid repeating information in other parts of your application package. Keep in mind that your statement will be reviewed as part of your overall application. Avoid repeating information such as test scores or awards won etc. The admissions officers will be able to see that information elsewhere. Instead, focus on events in your history where you can go more in depth and write about not only the outcome but also the process. By doing this, your graduate personal statement will play a unique and significant role in your application. Show strong familiarity with the school. At the graduate level, the admissions officers will definitely want to see that you have thoroughly researched the program and made an informed decision in your application. While there’s nothing wrong with writing about ‘renowned professors’ and ‘state-of-the-art facilities’, don’t leave it there. After writing a generality, follow immediately with detailed information. Tell the admissions officers about particular professors within the program and why their work interests you. Which facilities appeal to you and why do you consider them crucial to your goals within the program? Finally, you may want to write about the school in the larger context. Will you enjoy living where the school is located? Why? Use the concluding paragraph of your personal statement to summarize the main points of the essay and provide the reader with a strong vision of how you will use the knowledge and experience that you will gain during graduate studies. What do you see yourself becoming? What impact do you hope to have on your organization, field, and community? Remember that this is not written in stone, and no one will revoke your degree if you change your mind or life takes you in a different direction. The admissions officers want to know that you have a broad understanding of where you want to go and what that will mean not only to yourself but to others. Just follow the steps, and see what wonders happen! Good Luck! For further guidance on the college admission process feel free to ask by commenting below or send us an email.